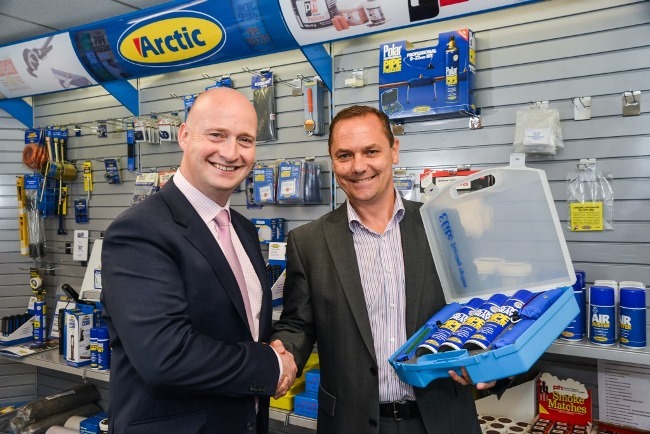 Hayes UK, a supplier of specialist safety, testing and servicing products to the plumbing and heating industry has acquired Leeds based Arctic Products, in a transaction that will create the leading player in the market for heating and plumbing consumables in the UK. Hayes UK was established in 1998 and has operations in West Sussex and the North West. The business designs, develops and sources product utilising a supply chain which spans the UK and Far East. It supplies organisations such as Wolseley, Travis Perkins and British Gas as well as hundreds of independent plumbing and heating merchants across the UK. Arctic has been acquired from Leeds based Volvox Group, and can trace its roots back to 1966 when it introduced the world to pipe freezing products. These are a range of innovative tools that allow plumbers to freeze water in a pipe system, creating an ice plug and enabling them to carry out repairs quickly and efficiently without draining the system. Almost half a century later, its Arctic Spray and Polar Professional product ranges remain the premier choice for plumbing and heating engineers. Recent years have seen Arctic grow and expand into new product areas such as testing equipment, tools, smoke and carbon monoxide alarms and other consumables. With combined sales of over £5 million and a stable of trusted brands including Hayes, Arctic, ICEMAN, Sleepsafe, ph and Vortex, Hayes UK and Arctic will have the most comprehensive product range in the market and has ambitious plans to grow the business significantly including development into new product areas. Export growth is also on the agenda with Hayes and Arctic already present in US, Canadian, Australian and French markets. Management believes that there is considerable potential for further growth in these and other, new overseas markets. Lee Parsons will head up the combined business as Executive Chairman alongside Karl Dallimore of Arctic, who becomes Managing Director of the enlarged group. “Bringing Hayes UK and Arctic together creates an exciting and dominant force in the supply of niche consumable products to the heating and plumbing industry. “I am thoroughly delighted with the merger of Hayes UK and Arctic. The deal was structured and arranged by Baker Tilly Corporate Finance in Leeds with Jim Whittaker and Amy Lewis advising Hayes UK on the deal. The acquisition has been financed by Santander who provided funding through its Breakthrough Growth Capital Fund and Finance Yorkshire which invested development capital from its Equity Linked Fund. “Our Equity Linked Investment of £1.2m is significant in that it will enable Arctic to fund the working capital required to re-locate to larger premises in Yorkshire, expand capacity and support product development. Stephen Roberts and Rebecca Grisewood of Gateleys acted as legal advisers to Hayes UK. Walker Morris (Peter Considine) advised Santander. Vincere (John Dewhirst) and Baker Tilly Tax and Accounting (Chloe Ellis) provided due diligence and tax advisory work respectively. PwC (Stuart Warriner and Charlotte Tracy) and Squire Patton Boggs (Paul Mann and Jitesh Lad) advised Volvox Group.